Jugglin' is the new sub-label of Raw Fusion Recordings which is run by label manager, DJ and club promoter Mad Mats. Based in Stockholm (Sweden), the Jugglin' label will feature the funkier sides of black music with focus on hip hop, soul / r'n'b, funk & reggae. The first release (due at the end of January 2003) comes from FREDDIE CRUGER - one of Stockholm's original b-boys. He has worked with all types of hip hop influenced artists and is well known in Sweden for his open minded approach to anything related to the hip hop and b-boy scene. Together with ADL (one of Sweden's most notorious hip hop MC), he has put together the massive reggae inspired hip hop joint "Running From Love". The tune has already blown up in the Stockholm clubs. With a catchy vocal sample from Johnny Nash and live instrumentation from old school reggae musician Desmond Foster, "Running From Love" is the perfect blend of raw reggae and underground hip hop. There is also a deep reggae dub by the Imperial Dread production team, which should go down with anyone who's down with the dark'n'dubby Lee Perry sound. 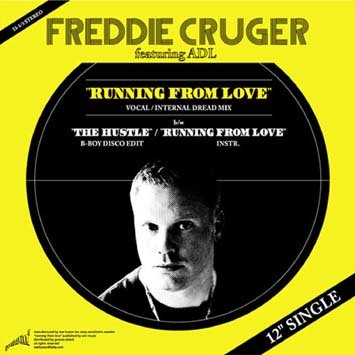 "The Hustle" on the flip is a good example of Freddie Cruger's open-minded musical approach. This b-boy inspired disco/latin track will make fans of Kenny Dope's old school disco sounds go totally bananas (4real! ).